Ancient Greek Theatres is part of the Tentative list of Greece in order to qualify for inclusion in the World Heritage List. While touring Greece in the summer of 2018, I stopped by a number of its World Heritage sites, and had a chance to see theaters at Delos, Acropolis (called Dionysos Theater), and Delphi. Wherever a theater is part of an ancient site, it is always among the most grandiose monuments to the skill and mastery of the builders of the day. The one at Delos has been pretty much leveled by the two thousand years of neglect - the shape remains, but it is significantly ruined. 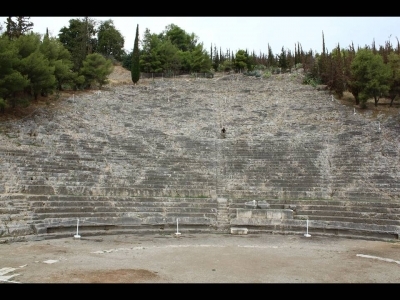 Dionysos Theater is better preserved. 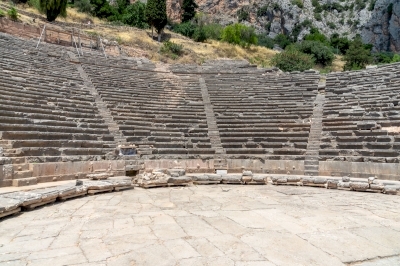 So is the theater at Delphi, the smallest of the three that I've seen. For all of the recognition that I am happy to grant to the master builders, I am ambivalent about this serial site standing on its own for future inscription. I don't think that theaters work as monuments of ancient civilizations outside of the context of the larger archaeological sites that they belong to. As part of the complex, a theater complements the rich picture of urban life along with other structures. You practically cannot ascribe any value to it without considering its relationship to the surrounding city, its proximity to the places of worship, places of commerce, living quarters of rich and poor. On their own, these theaters are basically relatively impressive feats of architecture that may or may not have survived the test of time all that well; the connection between them is no bigger than the fact that every city of note had one. So, for theaters that are part of already recognized WH sites, it appears redundant to have a separate explicit recognition of them; for the rest, it feels mildly unjustified to anoint one specific structure as worthy of recognition while leaving the surrounding ancient city off the list. The theaters at Delos, Delphi, or Acropolis are unmissable if you are touring the corresponding larger sites. I suspect a rare visitor will spend more than a few minutes on the theater itself. You can walk inside the semicircle at Delos, but only admire the other two from beyond the roped-off area. The “Ancient Greek Theatres” proposed site encompasses 15 theatres across Greece including three that are already World heritage sites (Epidaure, Delphi, Delos) and one, the Dionysos theatre, located on the slopes of the Acropolis, in the buffer zone. The Greek theatres definitively possess an objective OUV for the world’s culture and history. It embodies the level of advancement reached by ancient Greece. Moreover, this serial site puts the light on several major ancient Greece sites but also on more remote ancient greek cities and ruins that help acquiring a broader view and understanding on Greek antiquity. On top of those of Epidaure, Delphi and Athens, I have also visited the theatre of Argos which is quite impressive and surrounded by large ruins.